We are proud to share that the 2018 Mary Harriman Community Leadership Award recipient is one of our own! NYJL Sustaining member Congresswoman Carolyn Maloney made her name as a community leader in our own backyard—New York City. Congresswoman Maloney has used her experiences in both public service and the Junior League as a launching pad for policies that have helped support so many women leaders of tomorrow. Congresswoman Maloney joined the NYJL in 1975, and in the words of President Suzanne Manning, “…is a terrific example of someone who started at the NYJL as a volunteer and really took it to the next level and the level after that.” Carolyn embraces our mission and develops bills that support women because when women succeed in the world there’s less violence, less terrorism, and more focus on education and healthcare. Congresswoman Maloney was honored at this year’s AJLI Annual Conference for her dedication to serving the public and identifying and addressing the challenges women face in within their communities and nationwide. Through her work in Congress and in the Junior League, Congresswoman Maloney has helped, supported, and encouraged women and inspired them to become leaders themselves. When Congresswoman Maloney was younger she admits that she didn’t have dreams to serve in government. “I never had a plan to go to Congress or even to go into public service. When I talk to my male colleagues they say ‘Well when I was two I knew I would go to Congress’ and ‘I’m going to be President.’ They always had these huge aspirations, but sometimes women don’t—until recently—have the same aspirations.” Maloney believes it’s never too late to get involved, and the support of the Junior League can help women develop the leadership skills they need to improve their communities. In recognition of the vision of the founder of The Junior League, the AJLI Board of Directors established the Mary Harriman Community Leadership Award. This award honors and acknowledges an individual Junior League member whose volunteer efforts provide a contemporary link to Mary Harriman’s sense of social responsibility and her ability to motivate others to share their talents through effective volunteer service. Since 1990 when the award was established, it has been given to Junior League members whose leadership exemplifies our mission, vision, and values. 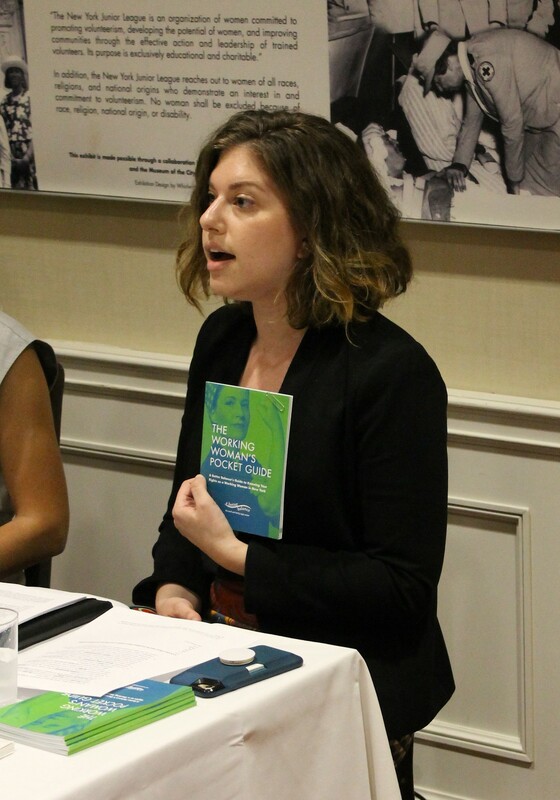 If you’ve ever wanted to use your voice to advocate for others, we invite you to learn more about the NYJL and our advocacy work. We build community leaders, and we support women who want to serve in public office. The NYJL Specialty Events Committee recent hosted the 3rd Annual Shop & Stroll Madison Avenue event, on what turned out to be a gorgeous, sunny Saturday in New York. As in previous years, the NYJL partnered with many Madison Avenue retailers to offer an amazing shopping experience with a portion of proceeds benefiting the NYJL. Each store had exquisite hors d’oeuvres, refreshments, exclusive shopping discounts and in some stores, special gift items with purchases. The morning began at the Astor House with a toast at the mimosa bar, breakfast bites, and a Uwila Warrior pop-up shop who gave a generous donation to this year’s Shop & Stroll event. Thank you Uwila Warrior for your continued support! 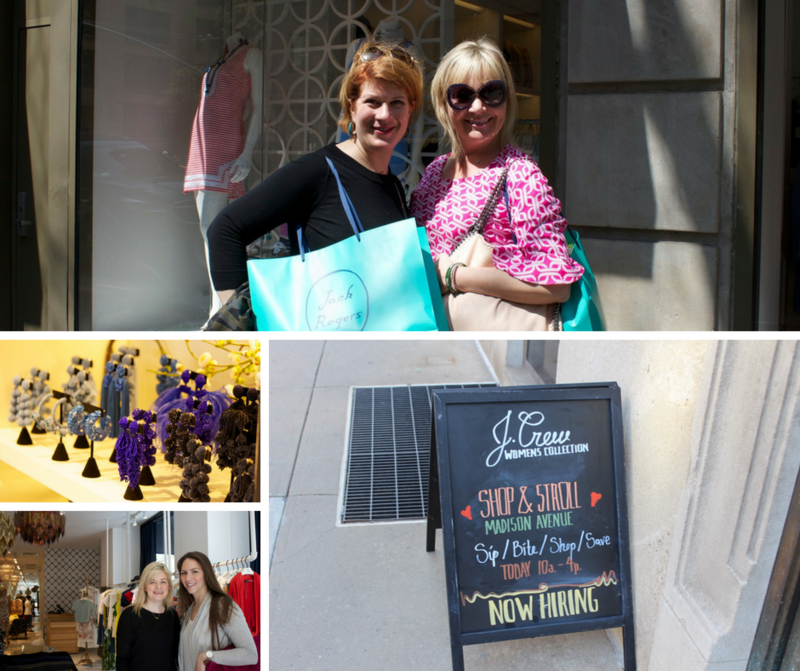 Each year, the NYJL holds a variety of events such as Shop & Stroll Madison Avenue to generate the vital dollars necessary to support our charitable activities. The success of these events, along with generous donations from individuals and businesses, helps us achieve our mission to improve the lives of women and children in New York City. We hope to see you at an upcoming fundraiser to learn more and to support the work we do in New York City. Thank you again to everyone who supported this year’s Shop & Stroll. It was a beautiful day that brought people together to support the NYJL and all its community efforts – we’re already looking forward to next year’s event! Educating children on the arts is a wonderful way to give them the opportunity to express themselves, build confidence and encourage self esteem. At the New York Junior League, the Spotlight on Performance committee enriches the lives of the children by exposing young girls and boys to the world of artistic expression and fostering an appreciation of arts. The Spotlight on Performance committee recently closed the 2017-2018 academic year with an astonishing performance at the Grosvenor Neighborhood House YMCA: a musical review of Moana. The show was extensive, with elementary school students singing songs from the movie and dancing to the pop version of “How Far I’ll Go” in front of their families and friends. Throughout the semester, students had explored different themes from this musical with focus on marine life in Hawaii and history of animation. At the captivating post-performance party, the children proudly showed their creative drawings of the Hawaiian god and marine life to their parents. The New York Junior League has established long-term partnerships with a broad range of community organizations that share our passion for improving the New York City community. 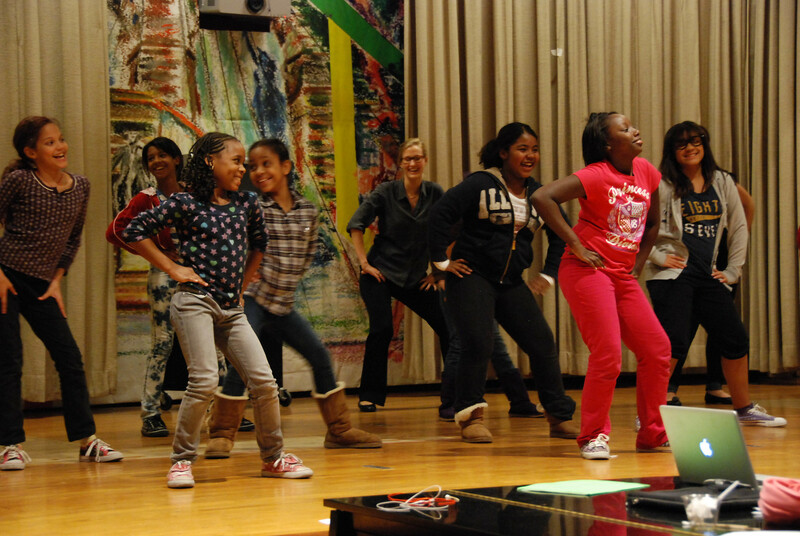 Beacon to Broadway volunteers work with older children at the Stanley M. Isaacs Neighborhood Center, and use drama, dance, artistic projects, and music to inspire the young boys and girls to express themselves. The LIFT committee works with 12 to 18 year-old at-risk teens at Leake & Watts (now Rising Ground) to provide them with youth development workshops and mentorship. Volunteers from CHAMP and CHEF work with a variety of partners to help educate children on health and wellness and provide families guidance on how to make life-long healthy choices. Learn more about the organizations and programs we are proud to work with. To increase awareness about the new Salary History Ban, Advocates for Public Policy hosted a training session to help NYJL volunteers, members of the community they support and job seekers understand their rights and offer some tips on how women can answer a question related to job salary, if asked. 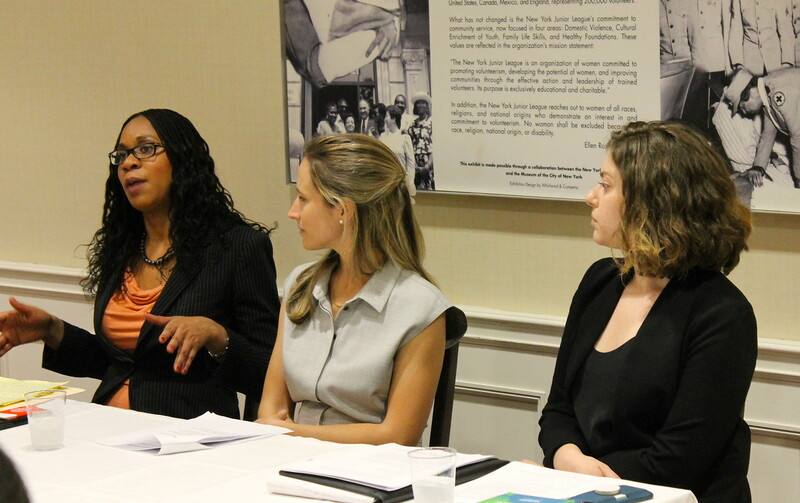 The panel included two attorneys, Sarah Brafman and Natalya Johnson, who worked with city legislators to draft the law. Under the law, employers of any size in New York City cannot legally ask about a job applicant’s salary during the hiring process, from advertisements or applications for the position to the interview process. The law went into effect last fall, and is aimed at helping reduce the wage gap between women and men. In 2016, the female-to-male earnings ratio was 0.805, a 1.1 percent increase from the 2015 ratio, according to the Census Bureau. The issue of unequal wages begins out of college, when women make an average of $16 compared to a men’s average wage of $20. The discrepancies are compounded over time and can be felt well into retirement, said Sarah Brafman, an attorney with A Better Balance, a nonprofit organization dedicated to promoting equality and expanding choices for men and women at all income levels. “This is a simple fix for a complicated issue,” Brafman said. “New York City is one of the first to implement this trend,” she said, although there are similar laws in effect in Philadelphia, San Francisco, Oregon, Massachusetts and Puerto Rico. Under the New York City law, employers are banned from inquiring about a job applicant’s previous history, and they are also banned from relying on that information, even if they receive it from another source. The law does, however, allow for employers to inquire about salary expectations, and they can use any information an applicant voluntarily discloses. Both speakers also noted the law does not apply to people who transfer internally within an organization. Since they are already part of the system, it is likely employers would already have knowledge of their salary history. Panelists agreed that while most employers in New York City should already be familiar with the regulations, it is important for job seekers to be prepared to push back in case they are asked to provide that history. Be sure to visit the Salary History Law FAQ if you have any additional questions regarding this new law. The Advocates for Public Policy Committee (APP) advocates on behalf of families, women, and children throughout New York City and state. Get in touch with the APP committee to learn more about the work they support. Rising temperatures and long, sunny afternoons means that summer is just around the corner. Before you make your holiday plans, we wanted to make sure you were aware of the activities taking place at the New York Junior League over the coming months. These events are a great opportunity to catch up with friends, meet new volunteers and start planning for next year! 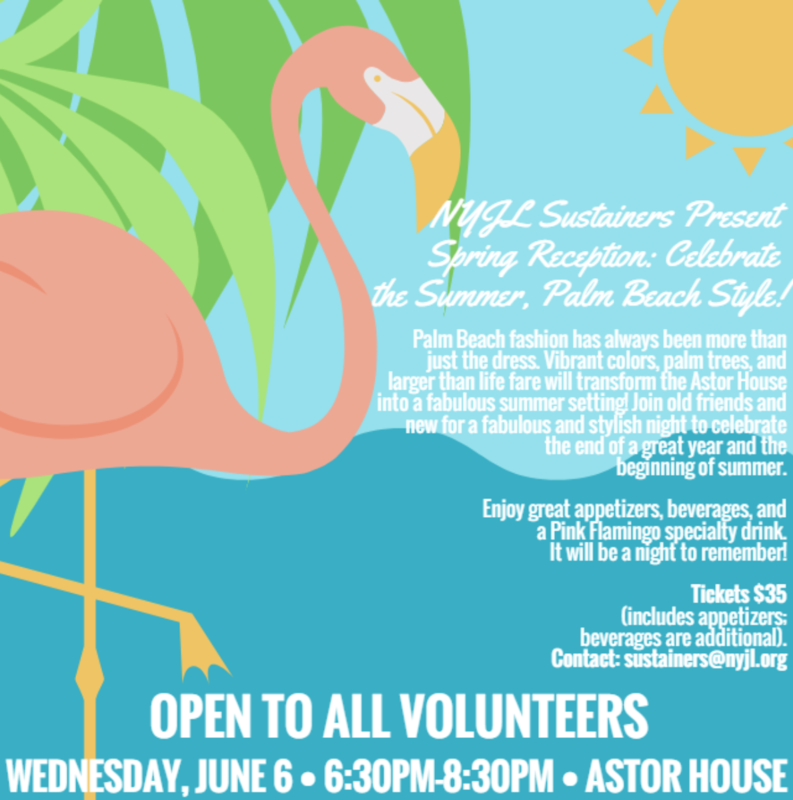 Sustainer-hosted event: Celebrate the Summer Palm Beach Style! Wednesday, June 6, 6:30–8:30 p.m.
Palm Beach fashion has always been more than just the dress. Vibrant colors, palm trees, and larger than life fare will transform the Astor House into a fabulous summer setting! Join old friends and new for a fabulous and stylish night to celebrate the end of a great year and the beginning of summer. Enjoy great appetizers, beverages, and a Pink Flamingo specialty drink. It will be a night to remember! Cost is $35 (includes appetizers; beverages are additional). Don’t miss out and be sure to register today! 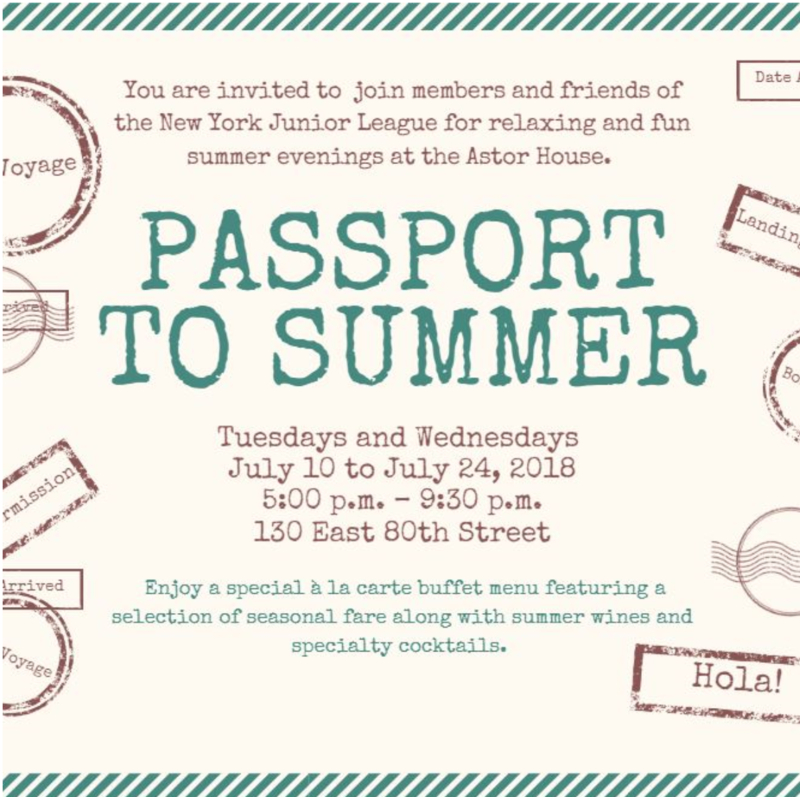 Tuesdays and Wednesdays from July 10 to July 24, 5:00–9:30 p.m.
Mark your calendars and join members and friends of the New York Junior League for relaxing and fun summer evenings at the Astor House. Enjoy a special à la carte buffet menu featuring a selection of seasonal fare along with summer wines and specialty cocktails. Be sure to check out the NYJL Facebook Group this Summer to stay up-to-date on everything happening at the League and to learn about ways to stay involved in the community.